This chart is comprised of the most popular models today; they are grouped on different features such as water capacity, price range and type of coffee delivery used (K-cup, pod, or combination of both.) I know this chart probably doesn’t look like a work of art but it will let you drill down to different qualifiers of personal importance. Click on the model name to go directly to the full review to learn more about a particular model or you can use the search box to the right. There are a number of various items for consideration, but I feel that the two below are some of the most important. At the risk of sounding too redundant I focused on the most important criteria below as they have stronger influence on consumers’ long-term satisfaction. 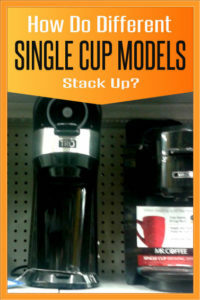 Some models use K-Cups exclusively while others will easily accommodate both K-Cups and soft pods. Also as a rule of thumb if the model accepts K-Cups it will generally accept the refillable “make your own” K-Cups as well. A few models will accept the whole enchilada, such as the Bunn MCU. The individual reviews will go into greater explanation of which delivery systems are accepted.